The Thalys Lounge, conveniently located next to the Thalys platforms in the Brussels Midi station, has been operated by Railrest staff since it opened in January 2004. Thalys frequent travellers can take advantage of a friendly welcome in comfortable and quiet surrounding while waiting for their train departure. Railrest has operated the Thalys Information desk since May 2007. 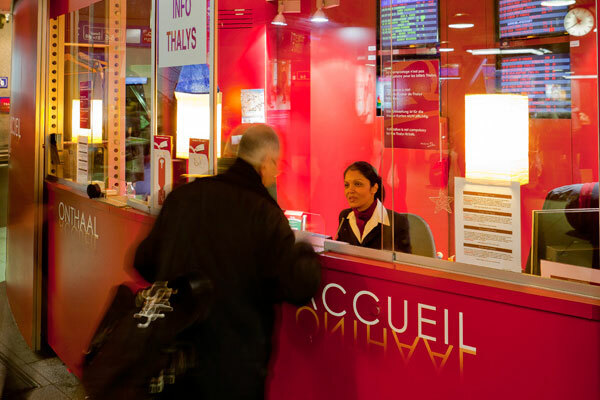 Located in the heart of the 'Thalys zone' in Brussels Midi station, the Thalys Information desk is the central point of information for Thalys travellers. Our friendly staff provides information about the Thalys service, timetables, connecting trains, station information... all with a smile! Railrest provides dedicated Platform staff, in Paris and Brussels, to offer help and assistance to the passengers boarding Thalys trains. Much more than ticket checkers, the Platform Attendants help passengers to find their coach and their seats.